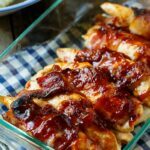 Bacon Wrapped Chicken with Jack Daniels BBQ Sauce makes a super easy weeknight meal and only requires 4 ingredients, plus salt and pepper. Bourbon, Bacon, BBQ Sauce. You can’t go wrong with the 3 B’s. The bourbon gets mixed into your favorite BBQ sauce. I used Jack Daniels Honey, but you can use any bourbon. 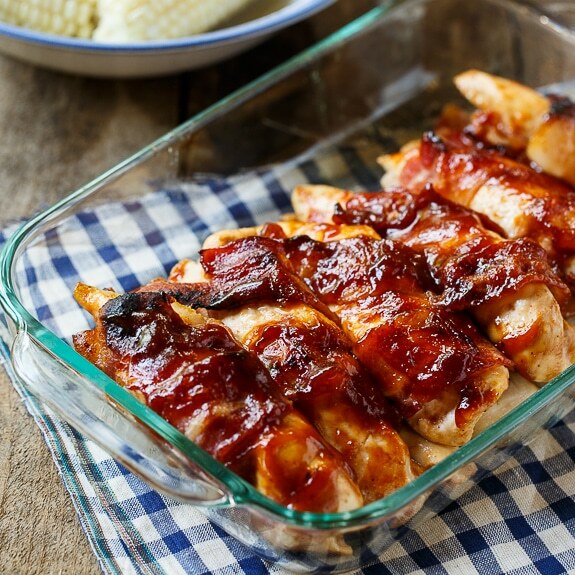 Chicken breasts are cut in half lengthwise to maximize the bacon and bbq sauce to chicken ratio. Into the oven the chicken goes for 20 minutes. It’s basted again and placed back in the oven to cook 10-15 more minutes. One last baste and a few minutes under the broiler crisps up the bacon and finishes this meal off. It’s a super tasty meal that’s a cinch to make! How can you go wrong with bacon, bourbon, and bbq sauce? 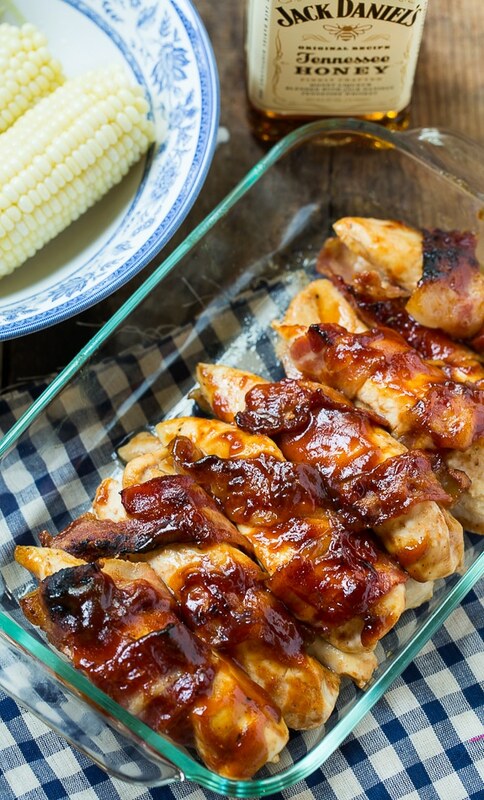 This Bacon Wrapped chicken with Jack Daniels BBQ Sauce is super easy to make. In a small bowl stir together bbq sauce and Jack Daniels. Cook bacon about halfway. You want it to still be pliable so you can wrap it around the chicken. Cut each chicken breast in half lengthwise so that you have 2 pieces that are the shape of chicken tenders. Season chicken to taste with seasoned salt and pepper. Brush all sides with BBQ Sauce. Wrap a piece of bacon around each piece of chicken. Place chicken in a baking pan. Bake for 20 minutes. Remove from oven, baste with BBQ Sauce and return to oven for 10-15 minutes. Remove from oven. Baste one more time and return to oven and BROIL for 3-5 minutes. This entry was posted in Dinner, Meal and tagged bacon, bourbon, chicken, poultry. Bookmark the permalink. What can I make this with?? Like rice or mashed potatoes etc? I’m trying to make this for Father’s Day but i don’t know what to make it with. 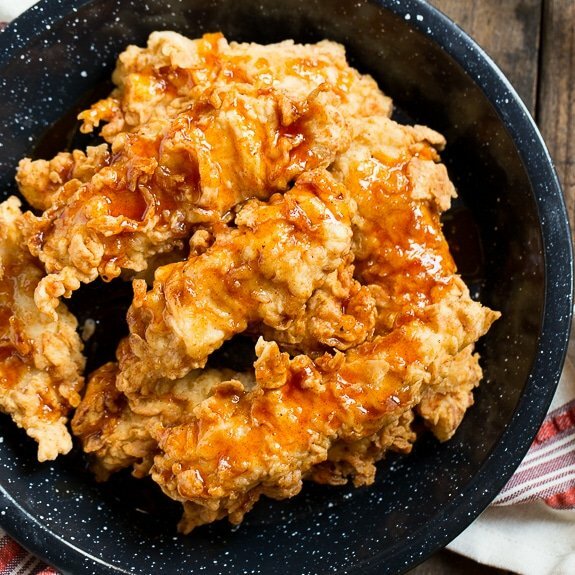 But this recipe is literally everything my father loves especially the jack Daniels sauce! This was an awesome dish. I marinated for four hours once wrapped in bacon. For an addition I added piri piri sauce to the marinade. Will have to try it with Piri Piri sauce! That sounds really good! Hi. This looks yum. I just wanted to check that if I make it for a dinner party, how much earlier do u think I can make it , like a few hours should be OK? And how do u recommend I re heat it so that the sauce and chicken doesn’t dry out. 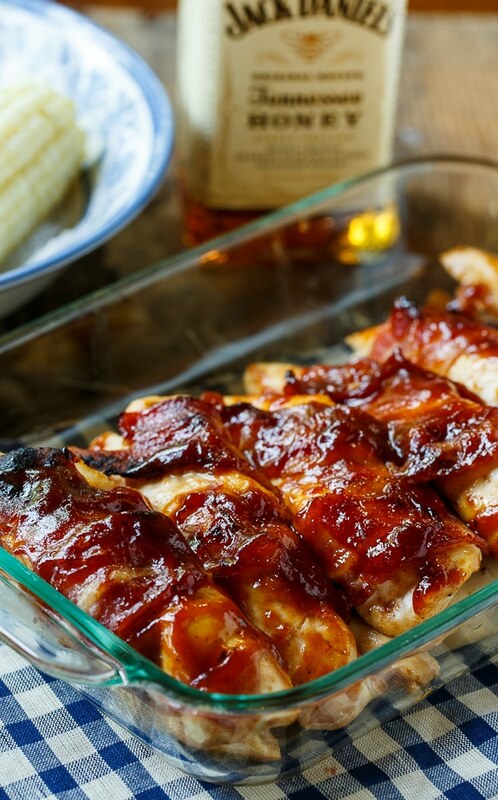 This meal includes 3 of my hubby’s main food groups: bourbon, bacon and condiments. The chicken makes it a meal. 😉 I’ll definitely have to try this one out on him! Jack Daniels BBQ sauce?!!! I think I love you. . what a fabulous idea!!! trying these!!! Can’t go wrong if bacon and bbq sauce are involved! Easy dinners are my favorite! 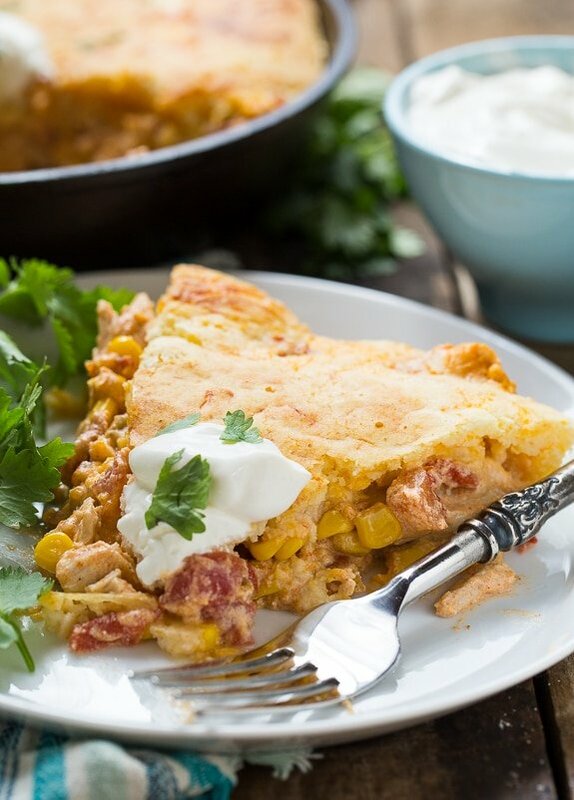 This looks so juicy & flavorful and would be a big hit at our house! Yum! 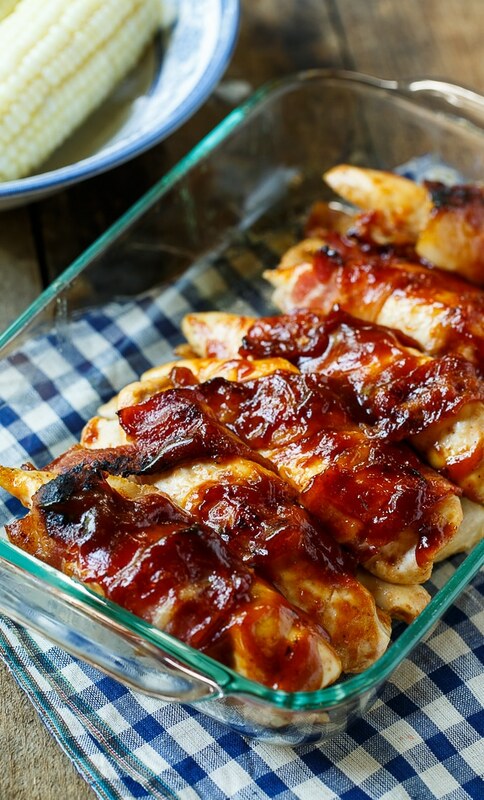 Anything wrapped in bacon and covered with bbq sauce is sure to be delicious! Love this chicken, Christin! haha you definitely cannot go wrong with bacon, bourbon and BBQ sauce! Those are my husband’s three favorites I think – he would LOVE this! Bacon wrapped chicken?! How decadent! Must try this! This is PERFECTION — I know it would be a hit here! You had me at bacon wrapped. Anything is better wrapped in bacon. Pinned!